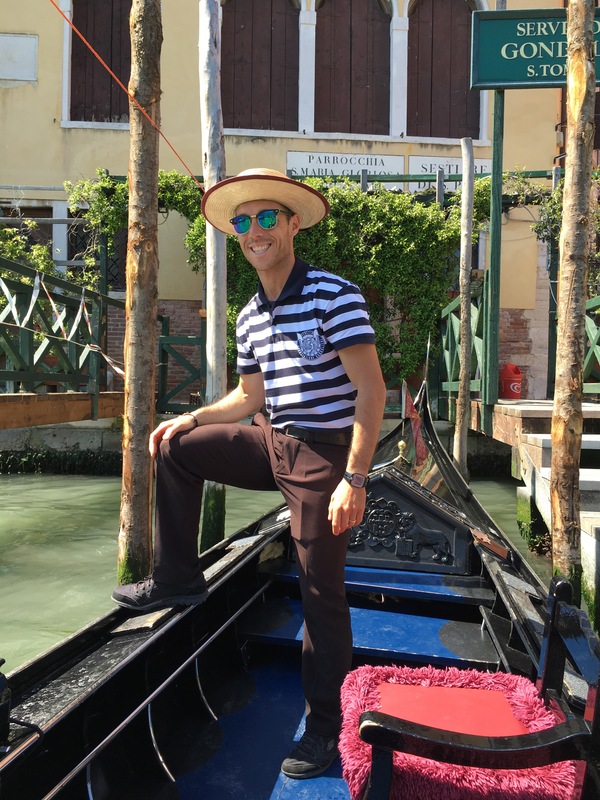 Today we visted Murano Island where Venetian glass is made, St Mark’s Square, St Mark’s, the Doge’s Palace, and went for a gondola ride. No pictures were allowed at the glass maker we visited, but if you Google venetian glass you’ll get an idea of what we saw. The most expense item I saw was a large coloured sculpture at €22,000. A wee bit out of our price range. Likewise no photos are allowed at St Mark’s but here is what the queues to get inside look like. If you visit a place like this you better get used to being in other people’s photos. 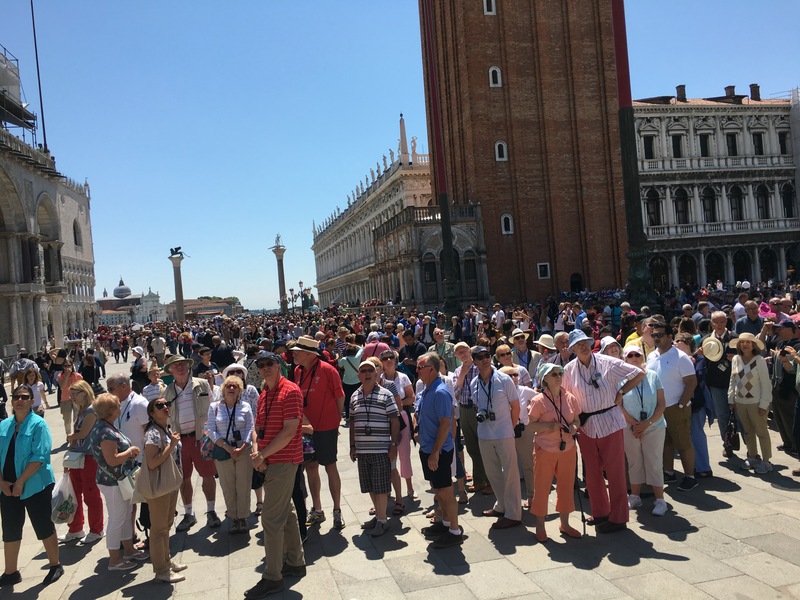 There must have been thousands of people standing around in St Mark’s square. The inside of St Mark’s is impressive, with the ceilings made of gold mosaic work, inlaid with mosaic figures. Unlike every other churches we’ve seen there were no individual paintings to be seen anywhere. Caroline noted that the church was all decorated in one style. Next stop was the Doge’s palace. The Doge was the supreme authority of the former Republic of Venice, and this palace was the seat of government and home of the justice system. Here is a view of the inner courtyard. Inside we were able to see the rooms used for council meetings, and to describe them as palatial would be understating it entirely. This is the largest room, and at the time it was constructed it was the largest room in Europe. I am pretty sure that is gold leaf on the ceiling. 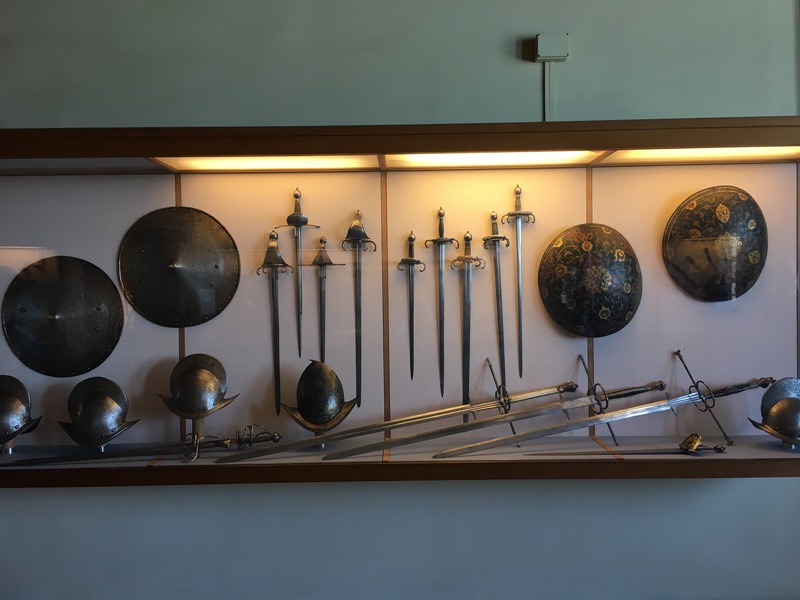 From the council rooms we proceeded to an exhibition of medieval and renaisance armoury. 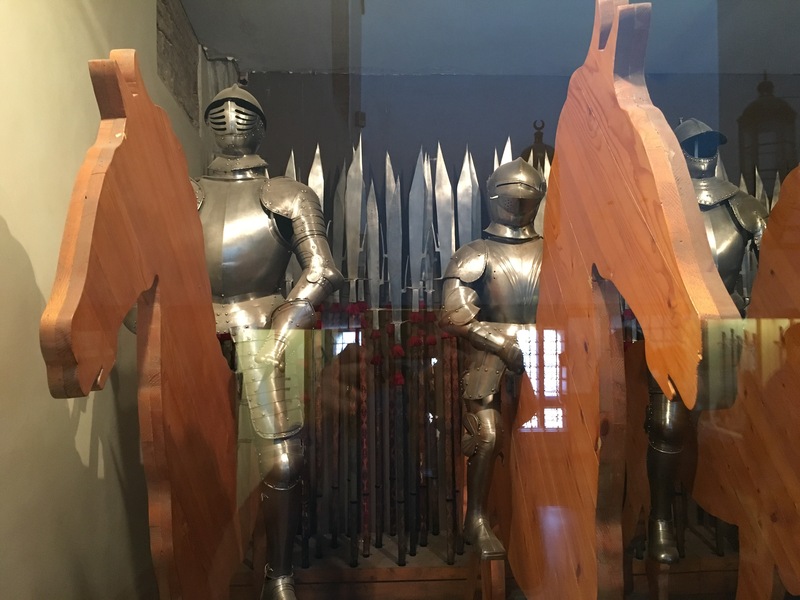 In the first room there was a set of father and son armour. There were also swords, shields and helmets. Then it was on to view the rooms where justice was dispensed. From that area the palace is linked by a bridge – the bridge of sighs – and this was the path people took to gaol after they had been convicted. There were narrow low passages and a few stairs like this one. The cells themselves were very simple. The left image below is an entrance to a cell, the right is a cell itself. Some of the cells have markings, probably scratched by prisoners. I stood for a minute inside one of the cells and imagined what it might have been like to be here. Food was probably passed in via a hole by the door, and there were no toilets. It must’ve been terrible indeed. On the way back to our appartment we took a gondola ride. 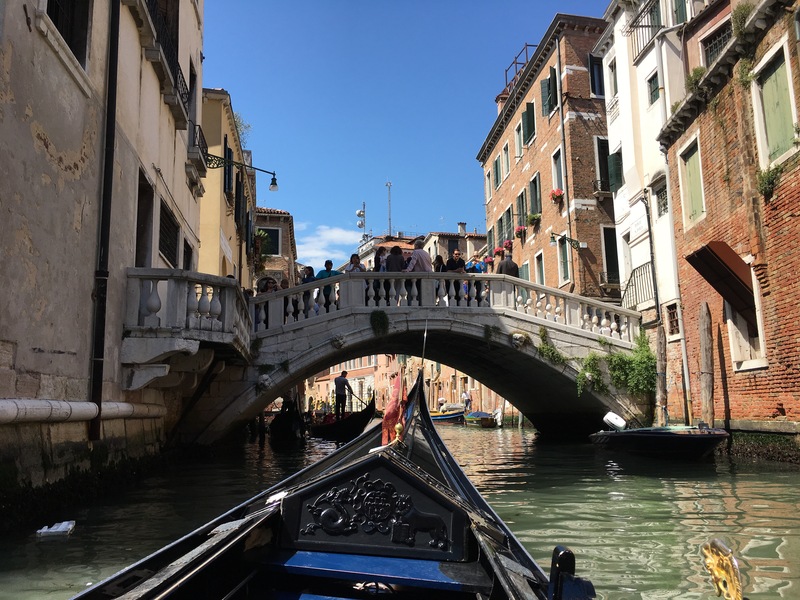 Our host recommended that we take a gondola from Saint Toma – this is apparently much less busy than the stations near Saint Mark’s square. Our journey went along the Grand Canal for a few minutes and then into one of the smaller side canals. It was interesting to see the buildings from this angle and our Gondolier told us that 30-40% of them are empty. It is very expensive to live in Venice, and we heard elsewhere that tourist appartments being bought up by speculators is driving out the locals. And here’s our view approaching one of the many bridges that go over the canals. I do have some video, but the wifi here is too slow to upload it. Perhaps I’ll do that when we get back to New Zealand.